Simple but effective, sprinklers have been used for around 200 years. 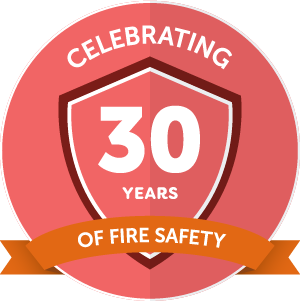 According to statistics, no person has lost their life to fire in the UK where Sprinklers have been installed. We offer installation and maintenance of all types of sprinklers, valve sets and pumps to LPC standards and BS EN 12845. We also have specialist equipment to cut and re-thread sections of large diameter pipe or to fit collars to pin-hole leaks. You can contact us regarding any concerns you may have about the installation or maintenance of your Sprinkler system, or to request a site survey in order to provide you with a quotation. 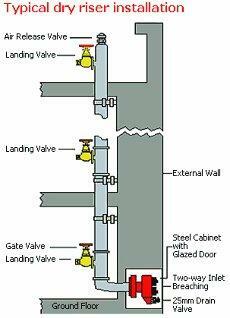 Dry risers (otherwise known as fire mains) are used in buildings over 18m in height. 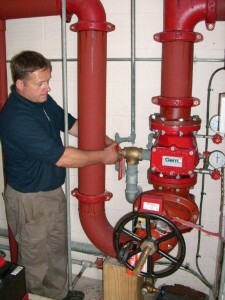 They assist the Fire Service by pumping water to landing valves located on every floor. Wet risers are used in structures over 60m high, typically with both pumps and water storage tanks situated on the roof. We can provide both design and installation of wet or dry systems. It's vital that dry risers are inspected and maintained on a regular basis as they can subject to neglect and in some cases vandalism. Be mindful of regulations - dry risers should be serviced twice a year and the hydraulic pressure should be tested at least once a year in accordance with BS 9990. These tests are undertaken for both preventative maintenance and as part of installation or remedial work. We then issue an appropriate test certificate.